A 10-by-12-foot shed is the ideal size for a backyard shed to store all your lawn equipment or outdoor toys. It is small enough that it can be built with the help of only a couple of people. Although the basic construction of the shed wouldn't change, you can choose the type of roof you put on and whether or not you want to put up siding. It is best to use weather-treated wood for this project because it will extend the life of your shed and prevent water damage. Measure out the size of the shed on the ground. At each corner where the shed will be, dig a 36-inch hole using a post hole digger. Put a 9-foot-tall 4x4 in each hole, and fill the hole with cement up to ground level. Starting at ground level, nail 2x4 boards to the corner posts every 16 inches going up the poles until you reach the top. Nail sheets of plywood to the sides of the shed. On the 12-foot sides of the shed, you'll need three sheets of plywood per side. Nail them so that the 4-foot side is against the ground. 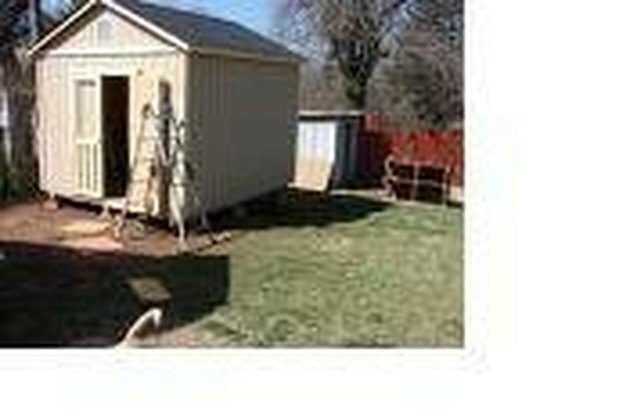 On the 10-foot sides of the shed, you'll need two sheets of plywood, plus a 2-foot section of a third sheet of plywood. Nail the plywood to each of the 2x4s. Line the top perimeter of the walls with 2x4 boards by attaching them to the corner posts. Buy premade roof trusses and attach them to the 2x4s at the top of the shed walls. Nail plywood to the top of the trusses to create the roof. The amount of plywood you'll need will depend on the size of the trusses you purchase. Cover the plywood with felt paper and shingle over the felt paper. Staple Tyvek to the outside walls of the shed. Choose the type of door you want for the shed. Depending on the size of the door or doors you choose, cut a hole in the front of the shed large enough to fit the door. Make sure you measure twice and mark the measurements before sawing into the wood; it is important that your lines are straight. Nail 2x4 boards around the perimeter of the hole you cut for the doors to create a frame. Attach the door to the frame by screwing the hinges into the 2x4s. You'll need someone to help you hold the doors while you screw in the hinges. Starting at the bottom of the walls, hang siding on the outside walls of the shed, probably to match your house.